Comfrey is a tall, easy to care for perennial plant that is often grown simply for its beauty. However, comfrey was once grown as a popular medicinal herb. Unfortunately, we have recently learned that it can be carcinogenic when taken internally, but it is still used as a topical treatment for skin irritations, cuts, sprains, and swelling. It is also used as livestock feed and making compost. Comfrey plants shoot up quickly, early in the season, and can easily reach heights of around five feet. The lower leaves are equally large, somewhat dwarfing the hanging clusters of flowers at the top of the plant. The form and size of the plants might have you thinking it is a shrub, but it will die back to the ground in the winter, and it does not get woody. Comfrey is in the same family as borage, a smaller plant with a similar structure. Because of its deep taproot, Comfrey is extremely drought tolerant and a useful clay busting plant. It produces violet, pink or creamy yellow flowers, born on forked cymes. Comfrey is reliably perennial in USDA Hardiness Zones four through nine. Grow your comfrey in full sun to partial shade, for healthy plants that do not fall over. 36 to 60 inches in height by 24 to 48 inches in width. Comfrey flowers bloom late spring or early summer. Comfrey makes an interesting focal point in a border and is great for drawing the eye to the back of a border. It looks very nice when grown at the ends of vegetable beds and somewhat formally, in the center of a four-square herb garden. The pale flowers and dark green leaves are set off nicely by chartreuse and bright clear yellows, like Yellow Foxtail Grass (Alopecurus pratensis 'Aureu') or a Canary Creeper Vine running up through it. Comfrey is widely adapted, but it will thrive in a rich organic soil. As with all rapid growers, comfrey needs a lot of nitrogen. Comfrey gets all its nitrogen from the soil, so some regular organic matter is essential. However, it is not particular about soil pH. A neutral to acidic range of 6.0 - 7.0 is ideal. Comfrey can be grown from seed, but it requires a winter chilling period to germinate. It is not unusual to sow seed and not see any germination for two years. If all you want is one comfrey plant, you can usually find them for a reasonable price in the herb section of local nurseries or by mail order. Plants can go outdoors once danger of frost has passed. When starting several comfrey plants, it is more common to use root cuttings. These are two to six-inch lengths of root which are planted horizontally two to six inch deep. Plant shallowly in clay soil and deeper in sandy soils. You can also grow comfrey from crown cuttings, but these will be more expensive. A crown cutting will include several eyes and may grow faster than root cuttings. However, the difference is negligible. Crown cuttings are planted three to six inches deep. If you are growing several plants of comfrey for harvesting, space them in a grid, three ft. apart. Once comfrey is established it will take care of itself. Each year the plant will get a little larger, and the root system will get denser. It is very hard to get rid of an established comfrey plant. Comfrey can live several decades before it begins to decline. Because of its taproot, comfrey is very drought tolerant. However regular watering will keep it growing strong and blooming. Leaves can be harvested and dried at any time. If you are growing it to harvest the leaves, you can make your first cutting when the plants are about two ft.tall. Cut back to within a few inches of the crow. However, if you begin harvesting early, you will not get any flowers. Leaves, flowers, and roots have all been used in traditional medicine, but use extreme caution if you do not know what you are doing. 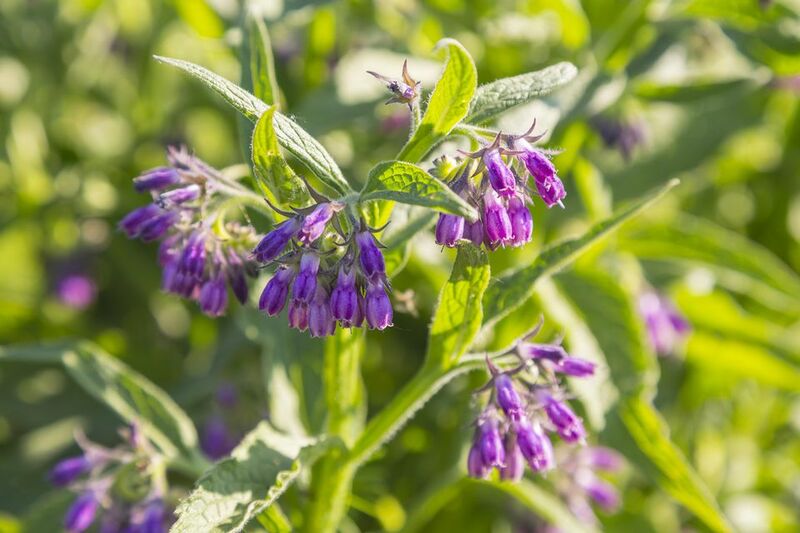 Comfrey should never be taken orally, and even a topical application can cause problems. One of the safest and easiest uses of comfrey is as a mulch for other crops. Comfrey leaves will slowly release all their nutrients their long tap roots pulled up from the soil. They are especially good around plants that like a little extra potassium, like fruits and tomatoes. No insects are known to be problematic to comfrey. There is a comfrey rust that can overwinter in roots and decrease vigor and yield, but it is not common in most areas.